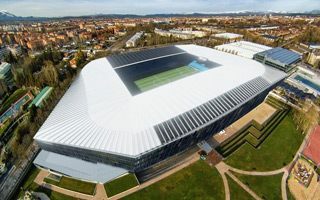 Not long before Christmas, the Basque La Liga side Deportivo Alavés revealed their promising stadium plans. If supporters thought that this year’s complete seat replacement is all they’re planning, they were wrong. Mozas+Aguirre Arquitectos created a vision of how their stadium may look in 2021. The existing Mendizorrotza stadium is to undergo complete redevelopment, though with as little change of the existing stands as possible. The old seating bowl remaining is good news for fans as it means steep and compact layout. Even more, capacity will grow by over 10,000 seats (to 32,000) with additional rows and a narrow upper tier on top. Not only the auditorium will be expanded, but the stadium’s volume too. It will grow towards both east and west, accommodating some plazas around it for additional floor space. This way semi-open plazas, restaurants, shops and a museum will be created. The idea is to make the stadium a meeting place on non-matchdays. It already serves that purposes in recent days as 900 people made their way for the opening of the design presentation on December 27. All of the above will be covered with sharp-shaped outer skin of laminated wood. Using natural materials should make it more friendly as a leisure destination, surely being more aesthetic than existing concrete and tinware. It’s relevant as the stadium is surrounded by other recreational uses and the goal is drawing more people. A modern and appealing outer form is necessary especially with the stadium’s scale changing significantly. Its height before reconstruction is below 18 meters, after works are done it will reach 27.5m (33.5 at peak). Rising above surrounding buildings, it will also host a significant photovoltaic farm on the southern and northern roof, on parts most exposed to the sun. StadiumDB understands the energy would be transferred to the public grid, making up for part of the consumption of football and secondary functions. So far there is no solid information about financing. The project’s cost is estimated at €50 million but Deportivo are yet to announce ways of funding all works. A framework should be ready early into 2017, perhaps already in January.